Cala'n Forcat, located 50km from the island's capital, Mahon, is set on a dramatic, rocky headland at the extreme western tip of Minorca. It's the island's most developed resort and is ideal for exploring the west coast. This lively, modern resort comes alive after dark at the local bars and discos. By day, why not snorkel around the rocks or simply lie back, relax and soak up the sun on the small sandy beach? 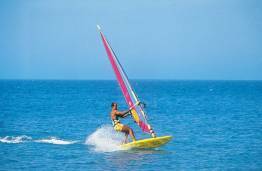 Cala'n Forcat has a relaxed, fun atmosphere and attracts young families and couples. 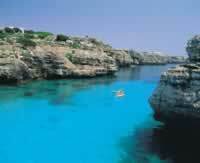 Minorca is famous for having over 1000 prehistoric monuments and sites. On the western side of the island, just south of Ciudadella, the prehistoric settlement of Son Catlar is well worth a visit boasting stone structures called 'talayots'. Down on the south coast there are a set of 90 or so caves dug into the cliffs called the Cales Coves. It is believed that these were once used as burial chambers by early man. Ingeniously, a large cave has been turned into a disco called the Caves of Xoroi. The dance floor overlooks the sea and is renowned for its sophisticated laser and light displays that shine out of the club into the night sky - it's considered to be Minorca's premier nightclub. Package holiday transfer time 1 to 2 hours. 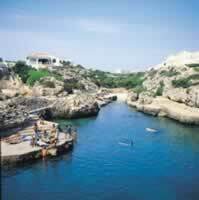 Cala'n Forcat is a deep inlet set on a dramatic coastline of rugged rocks. 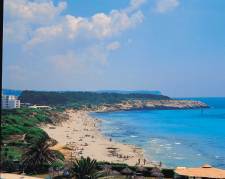 There are numerous concrete bathing platforms from which to swim, although sandy beaches can be found at Calas Piques and Cala Brut. 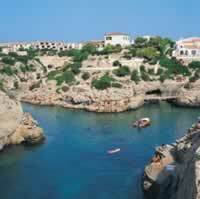 Nearby Cala'n Blanes has a small beach of fine sand, backed by palm trees. There are some individual shops scattered throughout the resort but best place to shop is around the Los Delfines area. Don't expect much more than beach goods and souvenirs although the nearby city of Ciudadella offers a more comprehensive shopping experience with its range of designer boutiques and elegant stores. 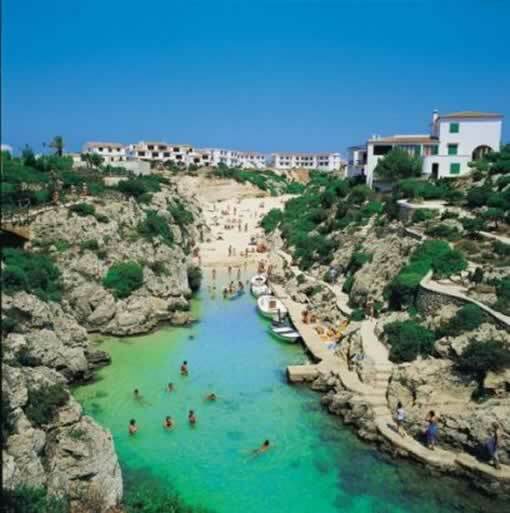 Cala'n Forcat is Minorca's liveliest resort and is the place to go if you want to put on your dancing shoes, let your hair down and enjoy the local razzmatazz. The area of Los Delfines is the focal point for fun, offering numerous disco bars, English theme pubs, karaoke dens and small nightclubs - all of which will keep you entertained until the early hours of the morning. 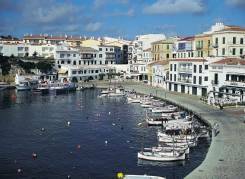 While holidaying in Minorca, it's well worth heading down to the capital city of the island, Mahon. Although its origins date back to Roman times, Mahon's strongest visible influence is actually British. For much of the 18th century Minorca was ruled by Britain and it was at this time that the British moved the capital from Ciudadella to Mahon and filled its streets with Georgian houses. Today, Mahon is a great place to go shopping with its mix of exclusive boutiques and traditional shops. Why not head down to the famous port area, Cala Figuera, where you can sit out in the lunchtime sun and enjoy a cool, refreshing glass of sangria while admiring the views out across the harbour? Cala'n Forcat offers a wide choice of cheap snack bars, pizzerias, burger bars and traditional English menus. There are also a few fish restaurants should you want to sample the local cuisine. Nearby Ciudadella offers a wide choice of traditional Spanish restaurants and tapas bars. Why not try the Minorcan speciality called 'caldereta de langosta' - a thick lobster casserole stewed with garlic, onions, tomatoes and herbs?